U.S. Coast Guard officials rescued a man and his dog from the water after their kayak capsized Tuesday evening near Benicia. At 5:44 p.m., Coast Guard officials received a call about an overturned kayak in the Carquinez Strait near the Benicia-Martinez Bridge. 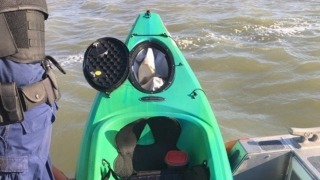 A boat crew from the Coast Guard station in Vallejo located the man's kayak, which had live bait on board, and began searching for him. The boat crew, with help from a Coast Guard helicopter crew, searched for nearly two hours until the crew on a nearby barge spotted the man. He was clinging to a piling near a Union Pacific Railroad bridge about seven miles from his kayak, Coast Guard officials said. At 7:30 p.m., the Vallejo boat crew rescued the man, who was wearing a life jacket, as well as his dog. The man was treated by Benicia Fire Department paramedics for mild hypothermia. He said he'd been in the water for three hours before he climbed onto the piling, Coast Guard officials said. Petty Officer First Class Christopher Mullen of Coast Guard Sector San Francisco said in a statement that this case is a great example of how vital it is for boaters to wear life jackets. "If the man hadn't been wearing his life jacket, the situation would have likely ended in tragedy," Mullen said. Coast Guard officials said the water temperature at the time was 71 degrees.